Today, information can be transmitted around the world at nearly 300,000 km per second - otherwise known as the speed of light. To navigate this ever-changing, increasingly complex digital ad climate, marketers need a global understanding of digital opportunities and trends. Such as which countries use social media channels like Facebook, Twitter and YouTube the most and how much money do consumers spend via mobile devices? 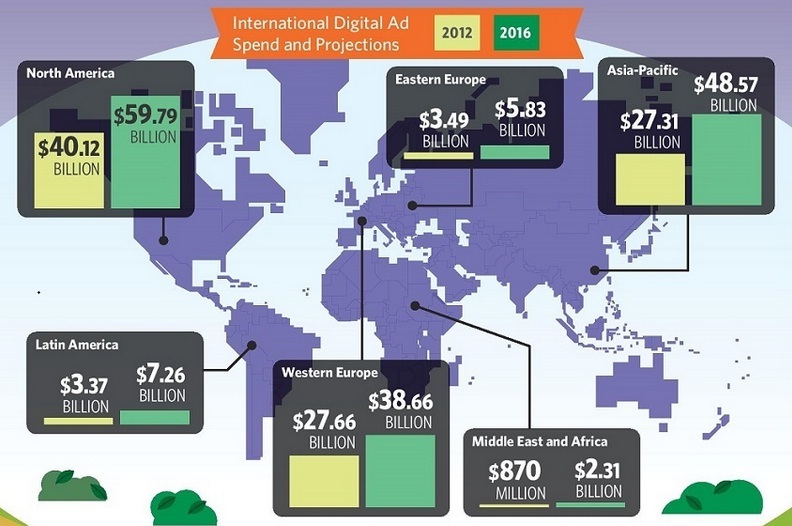 Take a look at this infographic called Around the World at the speed of light: Navigating the Global Digital Ad Landscape from marketo team to get started with global digital marketing in 2014. Takeaway: Now that taking your marketing global is as simple as the click of a mouse, it's more important than ever to keep your eye on the landscape. Stay alert for new developments - you never know where new opportunities may arise.